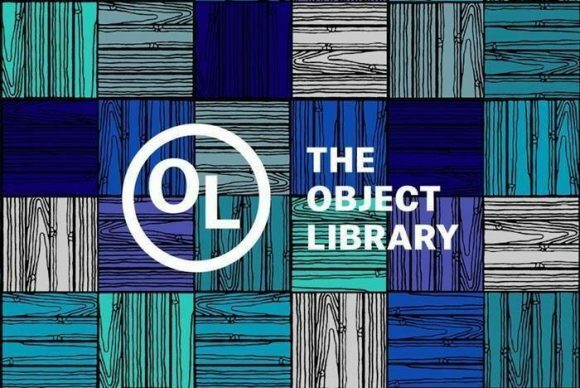 365 Things is the inaugural project of the Object Library, the new installation on the first floor of the Mina Rees Library. Participatory in nature, 365 Things invites all comers to contribute one object, no bigger than their head, to go on public display. Objects will be collected in the James Gallery during the Bring-a-Thing-a-Thon, October 16 and 17 from noon to 6pm. Objects in the library are pictured and described online, too. A launch event for 365 Things will take place in the middle of the Bring-a-Thing-a-Thon, on October 16 from 6pm to 8pm on the first floor of the library. The event will include opening remarks by Joy Connolly, the GC’s Provost, and Keith Wilson, Director of the GC’s Center for the Humanities, as well as a performance of a Katrina Palmer work by Stephon Lawrence. Curious about the floor? Wrapping around the library’s first floor is Logo 161 by Richard Woods Studio. The commissioned block-printed installation takes as its starting point the wood pattern of the original B. Altman & Co. department store floor, a section of which runs behind the library reception area. Logo 161 is a work of renovation that also asks what we are looking for when we resurface our environment. What kind of library might be most conducive to public study?